EAGAN, Minn. (AP) — Minnesota’s fumble gave Matthew Stafford and the Detroit Lions a fresh set of downs early in the fourth quarter two weeks ago, another opportunity to start climbing back into the game. Though they held an 11-point lead, the Vikings had been unable to pull away. On the first play after the change of possession, Stafford faked a handoff to Kerryon Johnson and rolled out to his right. With a hard stop, Stafford pivoted and threw back to his left where Johnson was waiting for the screen pass with four blockers within 5 yards of him. Vikings defensive tackle Tom Johnson wasn’t fooled, though. He kept his eyes on the running back the entire time, closing in to make the tackle for a 6-yard loss as soon as the ball was caught. Five plays later, with the Lions still in their own territory, defensive end Danielle Hunter scooped up a fumble and returned it for a victory-sealing touchdown. When the Vikings beat the Lions 24-9 that afternoon, the most encouraging development entering their week off was the start-to-finish dominance by a defense that didn’t look like its usual self in the first quarter of the season. That rollout screen play that Johnson blew up went for big gains against the Vikings a few times earlier in the fall. 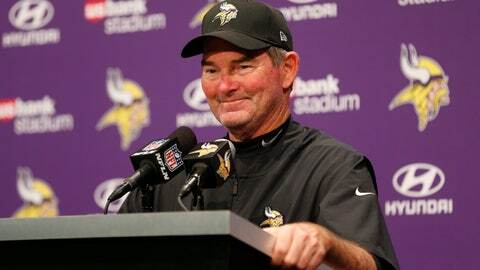 Coach Mike Zimmer and his staff put plenty of work into adjusting the scheme and the calls after in light of the vulnerabilities that arose in September. The Vikings allowed a season-low 209 yards to the Lions. Their next three lowest totals all came over the three previous games. The 4-3 system that Zimmer largely used throughout his time as defensive coordinator for Dallas and Cincinnati gained fame by the novel use of the double A-gap blitz that send the inside linebackers as pass rushers on both sides of the center. As more and more teams began to integrate that concept, the added exposure around the league gave opponents more opportunities to strategize about how to block it. Zimmer estimated that 10 or 12 other teams around the NFL now use a form of what his original base defense was. As for the Double-A gap blitz, Zimmer has rarely called one of those this season. One alternative that has worked well has been to overload one side of the line and use a defensive back to rush like Harrison Smith or Mackensie Alexander, who had the only one of 10 sacks of Stafford what wasn’t from a defensive lineman. General manager Rick Spielman will often join Zimmer for his 5:30 a.m. film review of the previous game on Monday mornings, and this season he’s been witness to perhaps more scheming than usual. “It’s pretty incredible to see how they evolve things and why they evolve it,” Spielman said. The Vikings (5-3-1) play at Chicago (6-3) on Sunday night for control of the NFC North, and they’ll need the defense to keep this up.